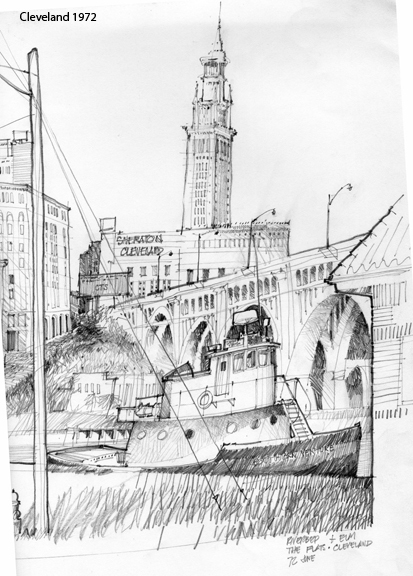 Reaching back into the past, here is a view of Cleveland, Ohio, as seen from the Flats on the banks of the Cuyahoga River, which I drew during my year’s service in VISTA in 1972. I had originally posted this image on my Facebook fan page in February, 2010, but it is now apparently missing from my wall. At the time, I was fascinated with and inspired by the work of Paul Hogarth, noted English artist and illustrator, who used his drawings and watercolors to document places and events during his many travels, a reportage style of illustration that is now being kept alive through the work of Urban Sketchers <urbansketchers.org>.